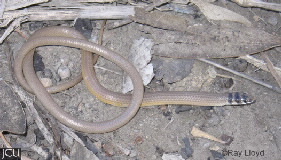 This legless lizard is found in a wide variety of habitats, usually under logs or similar debris or even in the surface layers of the soil. The greyish body may have several dark broad bands near the head and neck, more commonly observed on young animals; tail is long and slender, snout rounded. The lower surface is whitish.